2. Select Remote Desktop Services as the deployment type, then type the Name of your deployment. The deployment code will be generated automatically. If you prefer to define your own code, uncheck the "Autogenerate Code" box and Type your code (we allow from 3 to 8 characters). Click Create. 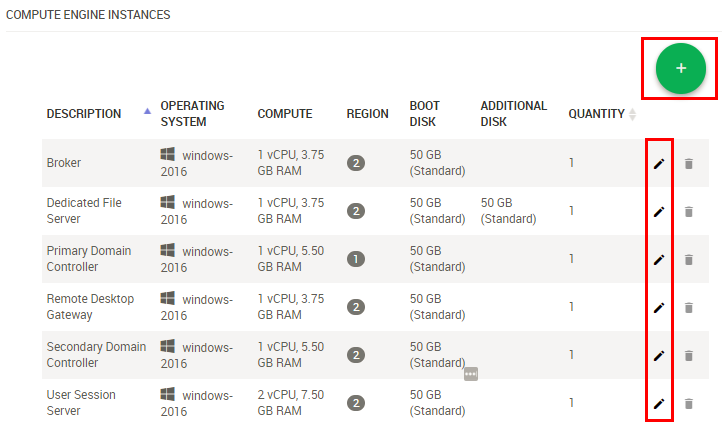 Secondary Domain Controller: Enabling the option will create Backup Domain Controller server that you can schedule to only turn on for 1 hour a day to synchronize the database with the primary domain controller. RD Gateway: provides you higher security for your Cloud connection. If enabled, you will get a task to input RD Gateway certificate (SSL) in .pfx format and a password after the provisioning. Make sure you request wildcard SSL cert or check with itopia support for the correct hostname for your certificate in case you are requesting a different SSL certificate type. User Profile Disk: If enabled, user profile configuration will take advantage of user profile disk technology. If you prefer other configuration for user profiles, you can disable User Profile Disk option and manually setup a different configuration of your choice for user profiles. Then select a project that will be associated with your deployment. It will appear in the drop-down list so you can select it. 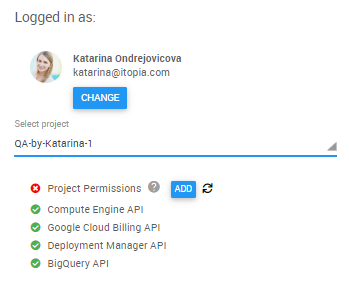 If you want to create a new project for your deployment, select "Create new project" option from the drop down. The system will try to enable the API's automatically. 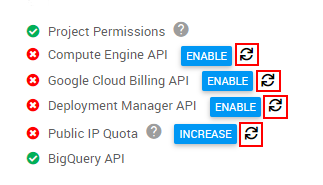 In case any of the API's stays disabled, click on the "Enable" or "Add" button next to it and you will be redirected to a new tab in Google Cloud Platform. In Google tab, click Enable button located in the top of the screen. APIs will turn green to confirm they were enabled so you can continue to the Region selection below. 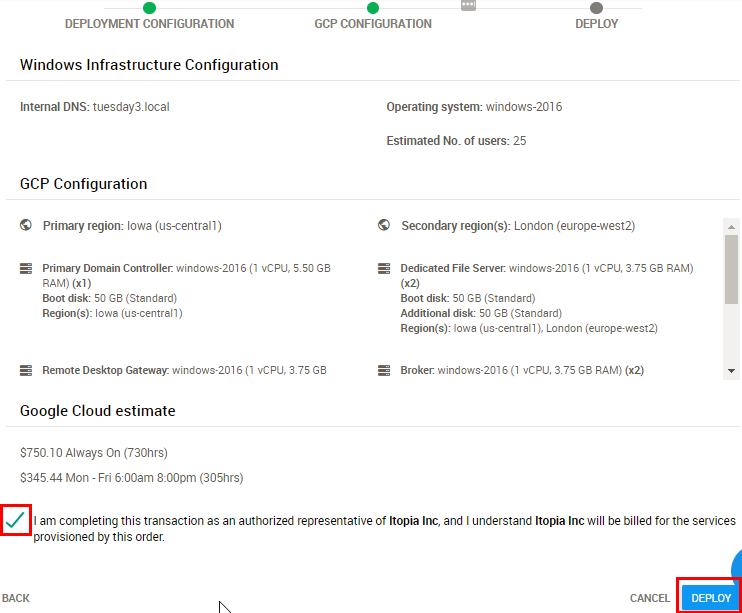 Companies with multiple sites located in different states, countries or continents can now be deployed under single domain with their environment created in Google datacenter that's close to their physical location. Just select the region and add it clicking "ADD REGION" button. On the bottom of the screen you can check the instances that will be created. You can add additional instances like app/ web/ database servers clicking on the green plus sign on the right. 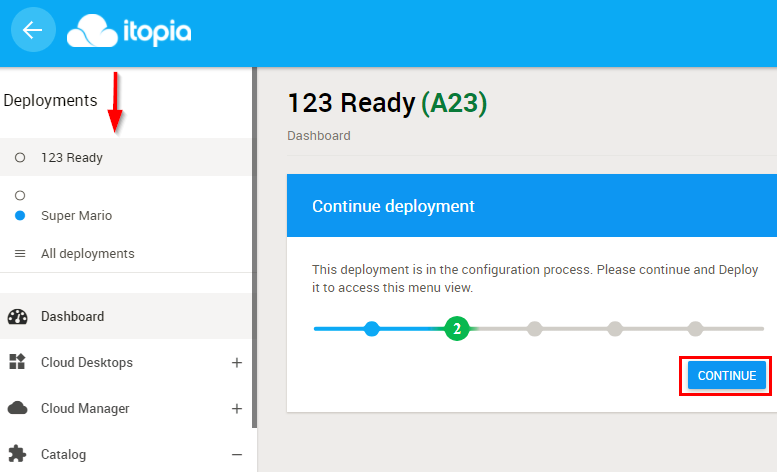 After the deployment is saved, you can see Provisioning Status in itopia CAS after clicking on your deployment dashboard and watch how Google servers are being automatically deployed and configured. 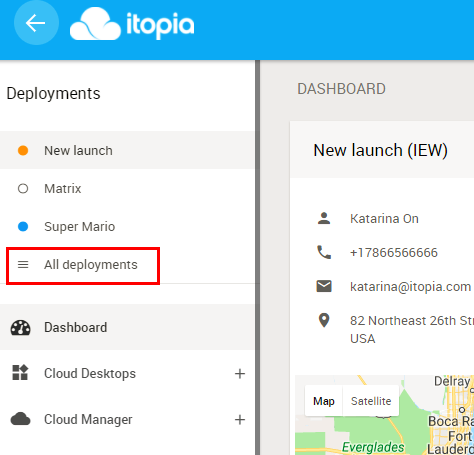 You can now go to itopia - Tasks section where you will see 2 provision tasks to be completed manually. After both tasks are marked complete, you will receive a link to download RDP file so users can connect to their cloud desktop. 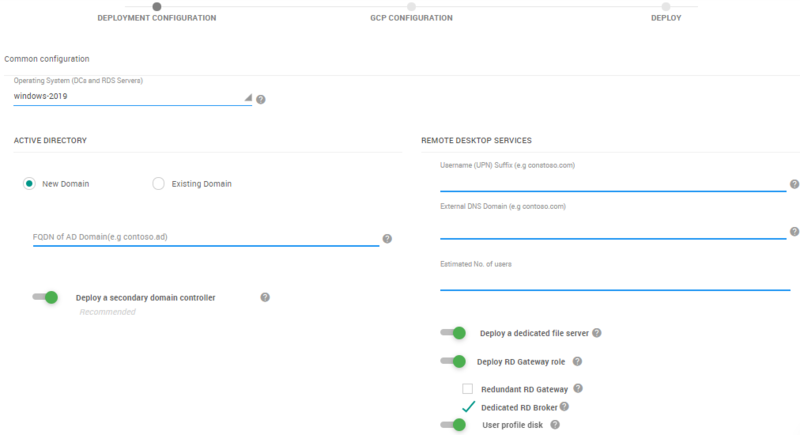 Add DNS record to configure your RDP file. 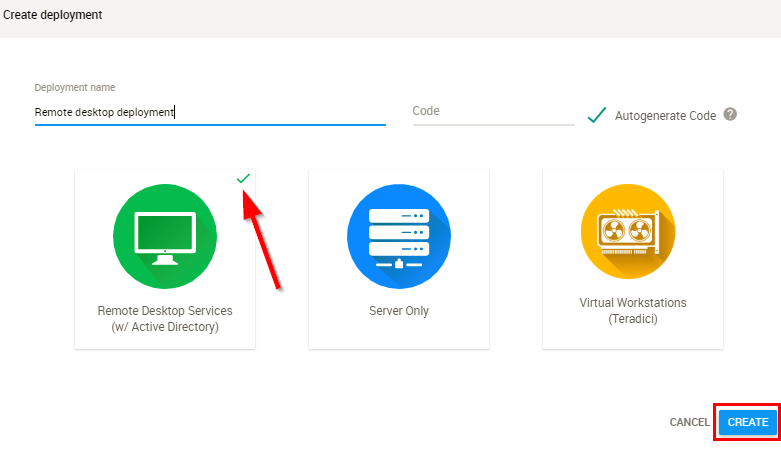 Note: If you'd like to build your remote desktop deployment extending your existing AD rather than creating a new domain, look at this article.